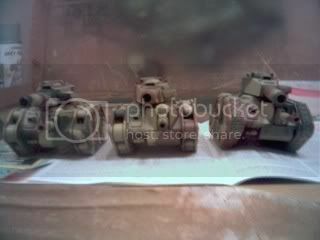 Thanks to everyone on Tau online for your suggestions regarding my armored company. Here are some WIP shots. The big tanks look interesting. What are they and what do they represent? They count as vanquishers, and are my command tank and ace, thanks for the suggestions in earlier posts Tom. They come from an English company called Pig Iron Productions. 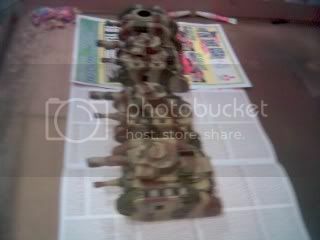 The tanks are made of resin and nicely cast. They look cool, as does much of the other stuff from Pig Iron Productions (I&#39;m definitely having some of those heavy infantrymen as Stormies for my Elysians). I trust we&#39;re going to see an Inquisitorial Leman Russ then? Next up are a Griffon and an armored fist squad using a model from grendel resins as the chimera. That one is a nifty conversio. I might use it to represent a salamander, scrap the troops and get another one. I&#39;m not sure yet. I&#39;ll post pics later in the week maybe you can help me decide. How do you weather your tanks Tom? They look great. 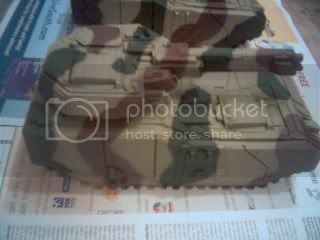 If you&#39;re referring to my Imperial Fist tanks, I just slap heavily watered down flesh wash on the side ( 1:8 ) starting from the top. I keep adding ink to the mix as I work my way down the sides of the vehicle until it&#39;s nearly neat at the bottom. Brush strokes should be from top to bottom. Wow... I love the unique class of tanks. Thanks for the comments. 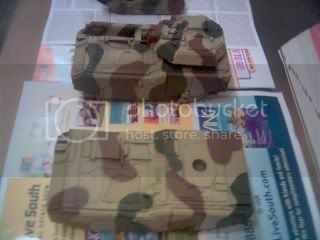 I was going for an Ambush pattern camo look similar to late WW2 German tanks. I might add random spots of color over the entire tank, brown and green on the tan parts, tan and brown on the green, tan and green on the brown. What do you think? One more question for you guys: Am I an official treadhead yet?